In 2015, millennials (born during 1981-1997) became the largest generation in the United States labor force and are now assuming positions of responsibility in public organizations. As public sector managers and leaders, millennials have a tremendous opportunity to positively impact their organizations, communities and country. Both the public organization and the millennial manager can take strategic actions to facilitate positive outcomes. Listen and Learn. Important for all leaders, listening is an especially vital skill for millennial public managers, who may lack years of work experience from which to draw. Millennial public managers should not squander the opportunity to learn from veteran practitioners. The saying, “That’s how we’ve always done it” can be reflexively defensive, but there may be good reasons for certain practices. Take the time to find out. Communicate effectively. To ensure effective communication, millennial public managers must understand the preferences of their superiors and subordinates. For example, while a millennial may rely on text messages or emails to communicate, some co-workers may prefer to learn of important decisions in person. Understanding these types of distinctions is critical to building and sustaining professional relationships. Use technology wisely. Millennials have grown-up with technology embedded in their lives. The millennial manager’s technological expertise is valuable in the workplace, though it should be employed to the level with which the organization is comfortable. All public sector millennials should be careful how they use their own social media, during and after work hours. Manage tactically. Millennial public managers should be clear about their expectations for staff and own present limitations. Focusing on doing well at core management duties can help steadily build credibility. Setting a model example of attitude, effort and professionalism doesn’t require a certain age or level of experience. Finally, determining the trust level of each co-worker, and incrementally introducing any changes, are advantageous practices. Own your mistakes. All new managers, regardless of background, will make mistakes. The response after the mistake is critical and can be an opportunity to display humility and strength in righting the wrong. This is especially applicable for millennial public managers that have colleagues already skeptical about their abilities. Cope with stress. Research has found that millennials are too hard on themselves. Through the challenges, millennial public managers must control their emotions at work and decompress when off the clock. Mindfulness is a valuable personal and professional strategy that can improve performance and productivity. Plan ahead. It is critical that public organizations cultivate millennial public managers to sustain the progress of previous generations. Hiring managers should look inside and outside the organization for the next generation of public sector leaders. The clichéd view of millennials as technologically dependent, self-absorbed and commitment-fearing does not fit all. In fact, a 2015 study by CNBC found that despite some unique traits, millennial preferences on six key work-related qualities were similar to the broader population. According to Deloitte’s global study, turnover rates for millennials in government are now lower than those for Generation X in 2006. But be open to change. If a public organization remains static, it runs the great risk of falling behind evolving stakeholder expectations. Millennials are the most racially diverse generation in American history and strongly believe in a culture of inclusion. Millennial public managers bring valuable new ideas and enthusiasm. They need a supportive environment, with quality professional development, to thrive as dynamic managers. Mentor them. Whether they are existing staff moving up the ladder or new hires, millennial public managers can benefit immensely from a good mentor. The mentor can help the millennial, often anxious for feedback, acclimate to their new position in a fulfilling manner. Professional associations can also assist in the mentoring process. Tell the organization’s story. To preserve institutional memory, tenured leaders should convey key moments in the organization’s history to the millennial public manager. This should include the culture and values related to the organization’s mission and accomplishments. 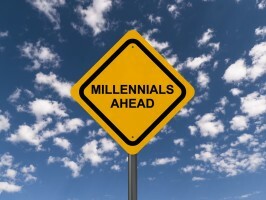 Finally, explain how the millennial public manager can lead the organization into the future. Use their expertise. As digital natives, millennial public managers can use their technological expertise to their organization’s advantage. Sam Taylor writes that millennial executives are “seeking innovative public-engagement solutions using technology.” This could include engaging stakeholders on Twitter, building an organization-centric app or designing a web-based survey to evaluate services. Have patience. Absent any red flags, it may take some time for the millennial public manager to flourish in their position. They may make a mistake or two as well. But there is nothing ‘wrong’ with the millennial generation. They need support, not judgement. After all, we were all young once! The deliberate blending of generations strengthens public organizations and can improve the quality of services offered to the public. Millennials have their own generational challenges, but remain optimistic for the future. By taking strategic actions, the millennial public manager and their organization can ensure positive outcomes. Author: Brian J. McLaughlin, MS, MPA is an adjunct faculty member in Villanova University’s Department of Public Administration. He has administrative experience with the judicial branch at the local, state and federal levels. This article presents the personal views of the author, and does not represent the New Jersey Judiciary. Email: [email protected].